Trying to capture and then optimise everything that goes on in the digital world for your business isn’t a simple process. In fact, this four pillars of online success document, which covers the best practice for online to offline success, has been revised over 200 times. 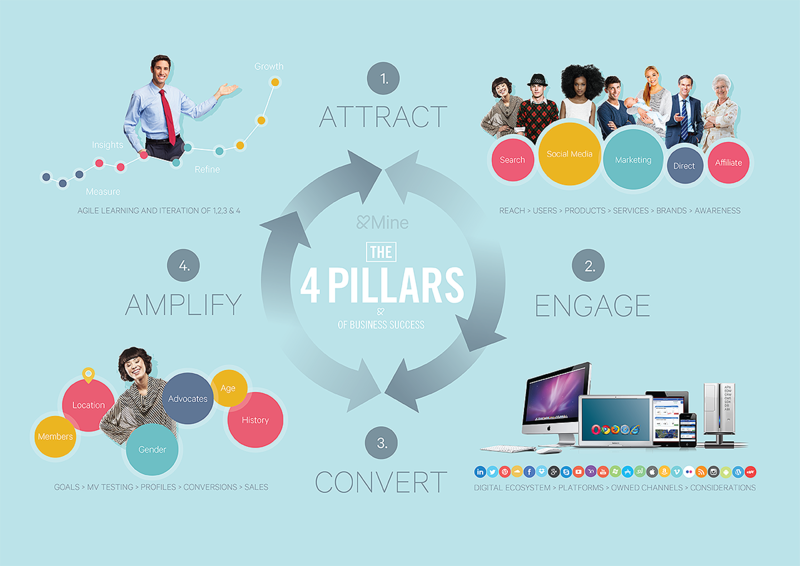 The &Mine team use these 4 pillars to benchmark everything we work on, be it a social campaign or an eCommerce system, a CRM development or a advertising graphic. It is important to remember that any and every part of your digital presence should not sit in silos. Connectivity and convergence is the key to a competitive end-to-end digital ecosystem that will grow your business. These four pillars of online success are the key elements of the digital ecosystem for any business, be it online, traditional or a hybrid of both. Each of the four pillars are divided into parts, all of which have plenty of detail behind them. We refer to these cornerstones in many of our presentations and meetings. For example, when we meet a new client and are trying to hone in on the particular services we should be allocating for their business – or for existing clients looking to develop the next stage of their digital success and where their priorities should be based on ROI. There is a short summary that follows the infographic below for each of the pillars. Please contact us if you are interested in finding out more about online success and procuring, engaging, converting and refining traffic across your digital footprint. For your own copy the four pillars of online success PDF, please click here: AndMine – 4 Pillars of Business Success. Businesses are looking to procure the best quality traffic in the most cost-effective way possible. Digital advertising is one of many ways to attract traffic and is driven by the benefits of CPA (cost per acquisition). Digital has created a multitude of new channels for reaching audiences and permeated many of the existing channels. Tech has now enveloped TV advertising as well, with the trend for watching TV on demand and on personal devices growing. The tipping point in advertising was felt in 2015 when 50% of all advertising went digital. This shift represents a huge turnaround from the days of TV dominating ad spend, solidifying digital’s role in growing website traffic. Your online space is connected to countless channels within the digital world – with opportunities to grow your own network and develop your own channel. Blogs, email direct marketing, RSS feeds, Twitter, Facebook, YouTube, Instagram, Spapchat, Whatsapp and other social networking platforms are dominating parts of brand communication. So, too, are mobile vs desktop environments. Companies that successfully define themselves in the evolving digital space will be the ones whose online communication is transparent, trustworthy and adapts well to all devices. These companies will be first to grow online loyalty and impactful results. There are two essential components here to grow and maintain. Firstly, membership and loyalty and secondly, advocacy. Building on this, conversions and results are the goals. Key Performance Indicators (KPIs), specifically CPA aligned with sharp digital strategies, will increase membership, loyalty and advocacy with positive flow on effects, for example, sales growth. Businesses that recruit a results-focused digital agency will capitalise significantly from in-depth knowledge of the many existing and emerging opportunities in Pilar Three. This is especially true if your focus is on driving conversions which have a positive overall effect on your ecosystem and bottom-line, as opposed to individual goals that will not translate into real value over time, eg. long term sales. In the digital space, everything can be measured, analysed and refined. Digital optimisation provides an ultra-fast feedback loop, which in turn enables significant growth across KPIs and conversion goals. Switched on companies are turning their attention to digital and developing their own online armies of loyal clients and customers. With the right digital refinement strategies in place, you’ll have more knowledge and control over your business success than ever before. "You are definitely ahead of the curve Michael seeing this was posted over 2 years ago now! great read, thanks Kristian"
"Thanks Kristian, appreciate the feedback :)"
"Big thanks for the efforts you have put into writing this article. Cotton Bags"